Cauvery Protests: Tamil Nadu To File Contempt Plea Against Karnataka ~ " Century Fox Post "
Chennai/New Delhi: The row between Karnataka and Tamil Nadu over the sharing of Cauvery water is set to escalate further on Wednesday, with the latter expected to file a contempt petition in the Supreme Court. The Jayalalithaa government yesterday decided to file a contempt petition “immediately” after the Karnataka government stopped the release of Cauvery water to Tamil Nadu. 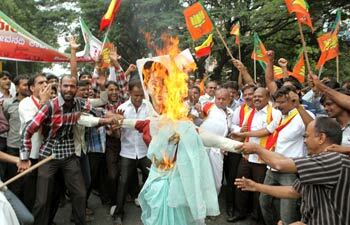 The Jayalalithaa government said Karnataka’s action amounted to impeding country’s federal structure. “In order to ensure that Tamil Nadu gets its due share of water, the Chief Minister has directed to file a contempt petition against Karnataka government which has unilaterally stopped releasing water, amounting to dishonouring the Supreme Court verdict,” an official release said after a meeting of Chief Minister Jayalalithaa with senior Cabinet colleagues and officials. DMK chief M Karunanidhi has, meanwhile, asked the Prime Minister to invoke Article 356 and impose Governor’s rule in the BJP-ruled Karnataka. Karnataka had on Monday night stopped release of water from the Krishna Raja Sagar Dam citing low storage in the reservoir, hours after Prime Minister Manmohan Singh made it clear that only the Cauvery River Authority (CRA) can review its order directing the state to release 9,000 cusecs to Tamil Nadu. Century Fox Report: Agitation will now turn violent say Cauvery Protestors. The apex court had earlier endorsed the CRA ruling asking the upper riparian state to release 9000 cusecs from September 20-October 15, a decision contested by both states, locked in the decades-long Cauvery dispute. Karnataka has been requesting the CRA to stay its 19 September order asking the state to release 9,000 cusecs of water to Tamil Nadu daily till 15 October and keep it in abeyance till the decision was subjected to review. The Cauvery Monitoring Committee is expected to meet in Delhi on October 11 during which the reports of the two central study teams that visited both the states are likely to be debated.